I must say, apart from the name, and the distinctive label, my familiarity with Trévallon was not great. I had vague recollections that they were the first to plant Cabernet Sauvignon in Provence (very wrong as it turns out), and that the red wine is one of Provence’s greatest and most expensive. 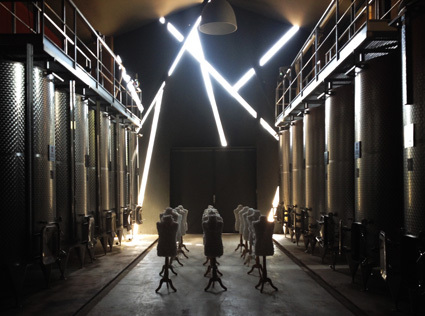 So it was with great pleasure and anticipation that I was invited to join a small group visiting the Domaine (followed by lunch at the spectacular Oustau de Baumanière nearby in Baux de Provence). The owner of Trévallon, Eloi Dürrbach, had agreed to open the property especially for us on a hot and sunny July Saturday. We were greeted by delightfully deafening cicadas in the olive groves, and two Jack Russells (mother and son as it turned out) who could not decide between being a terrier-like energetic welcoming committee and wanting to splay themselves with bellies sunwards and do nothing. So, they alternated. Because of some traffic and roads only a few millimetres wider than the vehicle we had arrived in, we were a little late, and despite telephoning, we could feel that this had not greatly amused Eloi (and rightly so) but the power of a shared love of wine seems to overcome almost anything and so it proved. 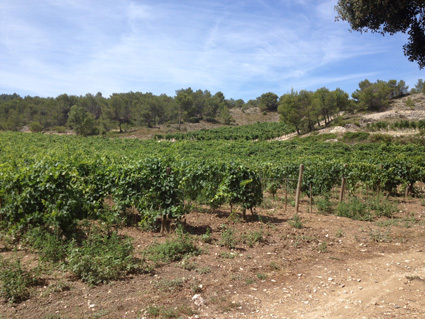 During a walk in the adjacent vineyards, Eloi explained that, in fact, Cabernet Sauvignon was first planted – very widely – across Provence. But the spread of Phylloxera in the nineteenth century wiped out all but the most tenacious or sandy of Europe’s vineyards. It was not replanted in the region until the owners of Château La Lagune in Bordeaux purchased Château Vignelaure in Coteaux d'Aix-en-Provence. They planted cuttings taken from the Médoc vineyards of La Lagune and had considerable success in the 1960s, although a succession of different and apparently indifferent ownerships subsequently rather dented the reputation of the property (now well and truly back on track). Eloi decided to plant here in 1973, and he chose Cabernet for its tradition and Syrah for its obvious suitability. He planted in vineyards made by dynamiting hillsides and ploughing the rough rock back into the soil – about as man-made as terroir gets in some respects, but the results speak for themselves. 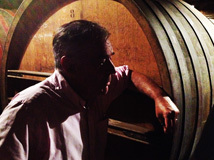 He has subsequently planted small amounts of white varieties (a tiny 2ha versus the still-far-from-enormous 15ha of roughly equal amounts of Cabernet and Syrah). The appellation rules, which permitted Cabernet Sauvignon at first, but not in the percentage Eloi had in the vineyards, mean that the wine has gone through various states of nomenclature, from AC Les Baux-de-Provence, to Vin de Pays de Bouches du Rhônes, and now IGP Alpilles. I’m not sure Eloi really cares greatly and nor has he need to. We tried the white wine from barrel first – in 2013 a blend of Marsanne and Roussanne with small amounts of Chardonnay, Grenache Blanc and Clairette. 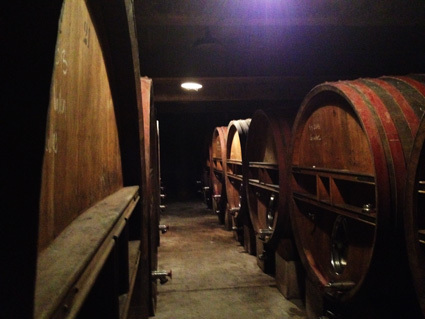 It has been fermented in oak barrels (a great part of them Austrian oak) and some 50% new. In fact the oak really does not overwhelm, and certainly does not dominate the youthful, esthery (boiled sweet) oily-textured and herbal wine. However it is, unsurprisingly, a bit disjointed straight from the barrel and I would very much like to taste it once bottled. All the ingredients are there, but the cooking is not yet finished. We then moved downstairs, after viewing the fermentation room. Everything about Trévallon is immaculate, clean and decorated with modern art. Between the gleaming stainless steel tanks was an art installation of tailors dummies on which were growing crystals of salt. I’m sure there is some biblical message going on here, but Eloi explained that this is the work a local artist, for exhibition later in the summer. The room was in use because its mixture of temperature and humidity was perfect for the growth of the crystals. They certainly glistened in the shafts of sunlight streaming through the asymmetrically cut window slashes at the end of the room. It was all a bit like being in a Peter Greenaway movie. Eloi’s support of the arts is hardly surprising given that his father René was a famous artist and sculptor, whose futurist drawings feature on the labels of Trévallon to this day. In the cellar we were treated to tasting the two components of the blend. Firstly Syrah 2013 from a large oak foudre where it spends two years –the red wine involves neither small barriques nor new oak. It was delicious - hints of savoury meaty tapenade flavours wrapping around a mass of black violetty fruit. Terrific quality and extract and decidedly drinkable. Then the Cabernet Sauvignon 2013. This was as expected more subdued and tight with a sack of tannins and dry blue fruit extract with hints of mint. It was balanced in a lick-your-teeth sort of way. Naturally, we tried a 50/50 blend of the two (the actual assemblage takes place after the two years in oak). Perhaps unsurprisingly the very youthful Cabernet with its massive tannins dominated the blend. Eloi then opened a finished bottle of the 2011. With a wonderful, laudable level of just 12.5% alcohol (which would be surprising for a fully extracted red from almost anywhere these days, but even more so from Provence) nothing about this wine was in any way unripe – it was pure and racy with excellent vivacious acidity and powerful fruit. The Cabernet tannins apparent in the raw material had softened hugely from another year in oak, and some time in bottle, and they in no way overpowered the juicy fruit of the Syrah. This wine would be just as perfectly approachable with half a baguette and a lump of comté as it would be with the five years more in bottle it really wants. A truly lovely wine. Trévallon is entirely organic (and certified) but stating it on the label is of no great import to Eloi. He employs as little sulphur as is necessary (which is very little indeed: 2mg/L – “you don’t need much sulphur if you have the right acidity”) and wild yeasts. However he doesn’t have much truck with the new wave of natural wines ”Les vins nature sans sulphites, je ne comprends pas. C’est la mode chez 'les bobos' à Paris, mais…”. I like this guy’s approach very much. And I like the wine even more. Lunch, which was spectacular, was to feature an older bottle (2001) so that warrants a further blog post I think!